She makes herself get up at dawn to walk along the shore. No one is around then. It eases her into the unsafe world; otherwise she would hide in bed all day. The police car usually passes her on the way back. He salutes. Her mouth laughs. Today she risks going as far as the village. 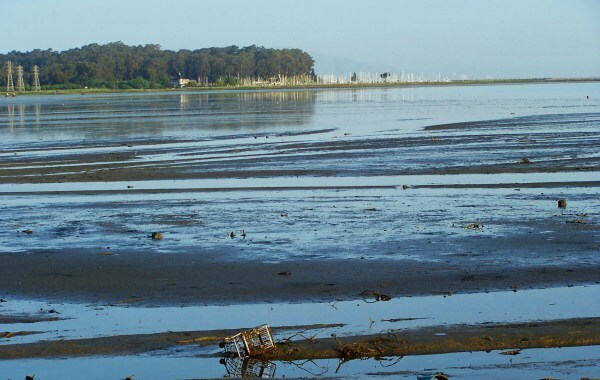 The tide tumbles and trips over garbage in the bay: broken branches, a shopping trolley upended like a beaten wife, seaweed, smashed beer bottles. Beyond the wreckage the water is smooth, reflecting a sky rubbing sleep from its eyes, a white house and the masts of sailboats waiting like her. This entry was posted in Short stories and tagged flash fiction, Friday Fictioneers, short stories, very short stories. Bookmark the permalink. Oooh beautiful piece! So many questions… why is she scared, why is she waiting? Is she just like the beaten up shopping trolley too? Writing to perfection, Karen, as always. I was worried about how obtuse this story was, Jessie, and you’ve reassured me. Thank you so much for finding the clues. Yes Karen such a beautiful piece as Jessie says. So much shown in so few words. Trusting the reader to see whats left unsaid. As always amazing story. These words and pictures give us pause and will return time and again. Thanks for your lovely comment, Margaret. I liked the phrase ‘He salutes. Her mouth laughs’. Well done, the whole piece portrays someone in trauma. Thanks so much for reading and for your comment, Sandra. Thanks, Susan, for reading and for your heart-warming comment. This is beautifully written from start to finish. A brief glimpse into a life that seems to be infused with insecurity and possibly some pain. Thanks so much for your wonderful comment, Subroto. It gave me a lot of pleasure to read. Your comment made my day, Siobhan. That is exactly what I had tried to portray and wasn’t sure if it worked. Thank you so much. Beautiful imagery here, very powerful! By describing the cart as a beaten wife, I got a hint of what might be plaguing the protagonist. I really liked how the dawn seemed to bring hope. The sky rubbing sleep from its eyes- very creative! I was thrilled by your comment, Adelie. Thank you very much for reading. Karen, as always you say so much with your 100 words. This woman carries pain, and we are left to figure that out… so many options, that you’ve offered up for us. Nice job! I always appreciate your comments, Dawn. I wanted to capture where she was in the cycle of recovery from abuse, and hint at her past and her future. The hardest thing for me is to get the balance right between saying too much and not enough. Thanks for reading. It’s a balancing act every week! I struggle, too, with what to share and what to with hold. As for thoughtful feedback, the feeling is entirely mutual. Thanks! So many questions come to mind with your story, all the while one feels for the character and hopes she will find her smooth water. Yes, the smooth water is definitely ahead for her. She just has to get through this unsettled time. Thanks for visiting, Zainab. She makes herself get out of bed is very telling. Trauma can be debilitating. Well done. I think she will be fine after she gets through this hard time. Although traumatic experience does shape us in different ways. Thanks for commenting, Rochelle. Beautifully written story, provoking lots of emotions and questions. Great techniques alluding to such a bigger untold story, well done! That’s high praise from the Queen of Metaphor! Thank you, Maree. When are you going to try your hand at Friday Fictioneers? Loved “…like the sky rubbing sleep from its eyes.” Loved so many parts of the story…well done! Thanks very much for that lovely comment, Jan.
Karen, your metaphors and beautiful descriptions all worked and although I got the idea of abuse, the way you wrote, intentionally or not, leaves other interpretations to us as well, if they fit what we need to see. I think that’s the really interesting thing about writing too, Janet. Our readers always have some input into our work depending on their own experience. Thank you for your thoughtful comment. One of my favorite things about Friday Fictioneers is the broad range of responses that come from a single photo prompt. Having grown up in the Midwest, away from most large bodies of water, I stuck with the color blue in mine. Several of you who have more experience around water have served up beautiful stories that are more literal to the prompt. Your story is the most literal I’ve found thus far, and it works in a way that most literal responses do not. You seem to have told the actual story of the photo, down to the last distant detail from a point of view that could easily have been that of a woman who snapped the photo. This is a great piece of realism. Nicely handled. Part of the pleasure for me too is reading other writer’s interpretation of the photo prompt. I always write before I read anyone else’s so I’m not swayed by their view of it. One of the things I loved about your work this week was your take on the colour ‘blue’ and I loved hearing about why you thought your mind went that way. My life revolves around the sea – I live by it and in it – perhaps that could have contributed to my rare-for-me literal interpretation. I hadn’t really thought about it until you raised the interesting idea. I’m really pleased you thought the realism worked. For me, a story is always about character first, and the ‘place’ serves them. Thank you so much for taking the time to make such a thoughtful comment. Thank you very much for your comment, Helen. Great job. She’s obviously a battered wife, and you have portrayed her mentality perfectly. Thanks for visiting, Perry. That’s exactly what I tried to portray and your comment made me very happy. So strong– yet all the questions of what has happened really is the strength of the story.. I love open ended stories like this.. Thanks, Freya. I appreciate your comment. “Beyond the wreckage the water is smooth” This says so much… Her life COULD be smooth, if her skin is bruised it MIGHT recover. Her soul might be repaired. Well done. That’s exactly what I wanted those images to show, Alicia. Thank you so much for your wonderful comment. Karen, another amazing piece of writing that is replete with allusions to the reasons for the character’s suffering and their devastating impact. But then we discover that there’s hope of recovery and a better future. All is beautifully conveyed through the character’s own actions, the action of the police car and its occupant, the tide, the sky and the masts of sailboats, together with some brief but salient descriptions of place. I’m honoured that you’ve taken the time to read my story so carefully, Diana. Thank you so very much. Oh, you make us feel the abuse, the trauma, the fear, and the tiniest hint of hope all in 100 words. Well done. It always gives me a thrill to hear that I’ve managed to make a reader feel something. Thanks so much for your comment, Sandra.